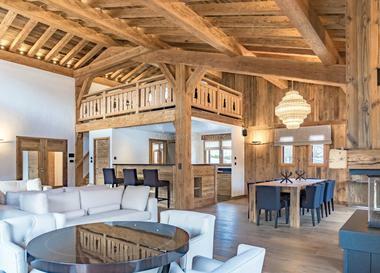 In Megève, the chalet Le Givre, providing 180 sq m of living space out of three levels, was originally a foxhole. 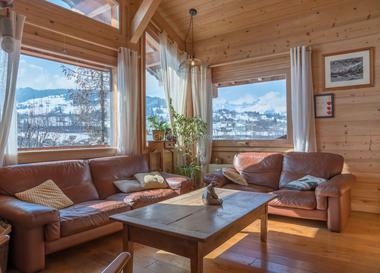 "Offering both ancient and contemporary decoration, the cabin provides an unobstructed view over the mountain range of the Aravis," stresses Emile Garcin Megève. The living room with fireplace and open kitchen, a combination of steel and wood, occupies the entirety on the ground floor. 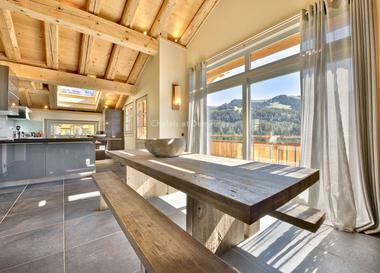 This space extends over the splendid 50 sq m sunny wooden terrace. Upstairs, the Master room has a fireplace, a living room with an office space, two dressing rooms, a bathroom and a balcony. Three suites located on the lower level open onto the sumptuous garden of 1,390 sq m. Coming with an outdoor parking space the property has access to the tennis courts and the swimming pool.